A collection of beautiful floral squares for you to crochet. Mix and match to create your own work of art. Afghan squares are such an easy project to work on, as they tend to be 12 inches or smaller, it means you can pop them in a bag and take them with you where ever you are going, from a road trip, to waiting for an appointment, or watching the kids playing sport, it is only when it comes to joining that these are no longer a portable project. 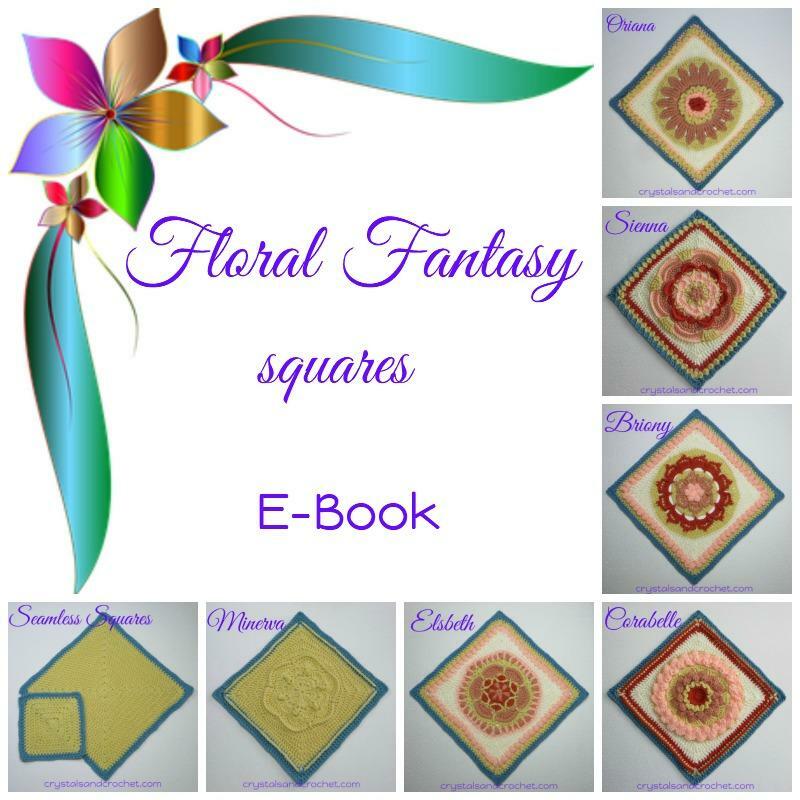 Floral Fantasy is a collection of six large afghan squares, one small – half sized square, and a plain square in two sizes. These squares can be made in all one colour, as with Minerva, or in many different colours, as with the other large squares. The plain, Seamless Squares can also be made in just one colour, or as many colours as you like. ♥ I encourage you to use your own creativity with colours, and with mixing and matching these squares to make an endless variety of projects. ♥ For more information on choosing colours, take a look at the posts in the special Colours section of my website. ♥ The meaning behind the names. Those of you who are used to my designs will know, that I never design without meaning. The idea has to flow from my heart and always has some significance. These designs are no different, they tell a little bit of my story, and where I am in my life right now. I have included some of the beautiful squares made by my amazing testers, to show you the difference colour can make to the look of a square. ♥ Oriana – To rise; sunrise; dawn; golden, this square is dominated by a stylised sunflower. I feel I am in a golden period of my life, where so many possibilities are opening up to me now, and it is time to take the opportunities that life is presenting to me. ♥ Sienna – Derived from the name Siena, which means old, or to be old. And is also linked to the sacred deep red colour of the earth. This design is based on the historical stylised rose. Though there are days when I feel very old, this is more the feeling of being an old soul, of being connected to the earth and the sacred wisdom of Mother Earth. ♥ Corabelle – Heart or Maiden, the pretty, pleated petals in this design overlap an open centre. When we have an open heart, life unfolds with joy. Living life with a heart centered attitude, learning to love, and getting out of the mind, makes life a joyous adventure. ♥ Briony – The name of a flowering vine used in folk medicine, crochet is a healing therapy for us all to enjoy. Healing or being a healer is a major part of my life, it brings a deep sense of satisfaction to be in control of your own health and wellbeing. ♥ Elsbeth – Pledged to god, everything in the universe is linked and connected to all. Life takes on a simplistic vibe when we realise that everything is connected, all that we say, think and do has an effect on ourselves and those around us. ♥ Minerva – The Roman goddess of wisdom and invention, the arts and martial strength, a simplistic flower with strong boundaries. When we set boundaries, and have the strength to maintain them, we use the greatest wisdom of all, the wisdom of loving ourselves, sometimes we have to be a little inventive in the ways we make sure others do not overstep our boundaries though! ♥ Florette – The roman goddess of flowers, or little flower, a smaller version of Briony. ♥ The Seamless Squares are very similar to my other seamless squares, this time I have adjusted the corners and number of rows to give you a perfect 5 or 10 inch square using Double Knitting yarn and a 4mm hook, or 6 or 12 inch squares using worsted/Aran weight yarn and a 5mm hook. I have put all 8 patterns together in a handy e-book, which includes all the notes, abbreviations, and special stitches at the beginning of the book. The special stitches are also included where they are first used in each of the patterns. The e-book is full of photos, for step by step instructions to make each of the squares, all of the patterns are easily achievable for adventurous beginners to experienced crocheters. There are two versions US terms and UK terms, once purchased, you can choose to download whichever you prefer. ♥ Here are some examples of how my wonderful testers and I used the squares. ♥ I made a full size blanket, using 5 Minerva squares, 4 of each of Oriana, Sienna, Corabelle, Briony, and Elsbeth. Along with 44 smaller squares made up of both Florette and the small seamless squares to edge my blanket. I used my favourite yarn, Stylecraft Special Dk with a 4mm hook, the finished size is 67 inches square. I used a total of 5 x Storm Blue, 4 x Cream, and 3 balls each of Vintage Peach, Buttermilk, Tomato, and Apricot. You can buy all these colours online at Woolwarehouse or Deramores. I then added a simple border of chains, single crochet, V-stitch and finally points with a Perfect Picot on top. This border is an adaptation of border #32 from Every Which Way Crochet Borders by Edie Eckman. If you have not seen her books, do go take a look, you will never be stuck for a border idea again. The Happy Colours are: Stylecraft Special Dk, Emperor, Empire, Jaffa, Bright Green, Bright Pink, Wisteria, and Sunshine. As you can see, Ineke used one of each of the larger squares, with little Florette and Seamless Squares inbetween, she then designed her own border using some of the elements from within the squares. What a gorgeous way to keep your knees warm on a chilly day. Here are all of Ineke’s squares. ♥ Becky made a table runner, the colours Becky chose are quite festive, and so the idea of making them into a Christmas table runner seemed perfect. Becky used Red Heart Soft yarn, a worsted weight yarn available widely in the USA, with a 5mm hook. This was a stash buster project for Becky, she used Off White, Wine, Wheat, Rose Blush, and Dark Leaf. These are all of Becky’s squares. Terena also used Stylecraft Special Dk with a 4mm hook. Her colours are Lobelia, Lavender, Cream, Sage, and Fuchsia Purple. Here are all of Terena’s squares. ♥ Pauline is making a throw with her squares, as soon as she is finished I will post some photos here. Pauline used Stylecraft Batik mixed with Stylecraft Special Dk and a 4mm hook. and Stylecraft Special Dk – Grey. Here are all of Pauline’s squares. Have fun, and let your creativity know no bounds! Love, love , love your squares. They are all WONDERFUL !!!!!! !